Where are the Best Hiking Trails? The Smoky Mountains Of Course! The Smoky Mountains of North Carolina and Tennessee. Hike to waterfalls, gaze at amazing mountain peaks, take a step back in time on a history trail, stroll alongside a river, or take the family on a nature walk, it's all here! The first time I went there (and every time after) I felt like I had entered another world. You will too! *150 hiking trails covering over 800 miles! *Amazing scenery! Everywhere you look there are mountain peaks, overlooks, wildflowers, and wildlife. *It's free! There is no admission charge and no fee to explore the trails. *Many lodging options! I mostly tent camp, but I've also rented a cabin. There's also hotels, chalets, inns, bed and breakfasts, whatever you choose to suit your comfort level. *Lots of things to do! Mom and I go for the trails, of course, but when it's a family affair, everyone can still find something they want to do. Like historic exhibits, fishing, biking, tubing...you name it! Are you hooked yet? Ready to start packing? Wait! There's some stuff you need to know first. When you take a vacation you want to have a plan, right? So you can see what you want to see and do what you want to do. But that takes a lot of time, right? Wrong! Not with the Smoky Mountains Hiking Guide to help you. That's why I'm here:) I want to share what I know with you and give you all you need to know to have an amazing vacation in the Great Smoky Mountains. Hike the Appalachian Trail, Yes You Can! Some of the best hikes along the Appalachian Trail are found in the Smoky Mountains. Find out about them here. Check out this list of the best hikes in the Smokies. You'll want to hike these trails again and again! Challenging hikes offer great rewards for all that hard work. Beautiful views await you in the Smokies! Easy Hikes, Take it Easy in the Smokies! 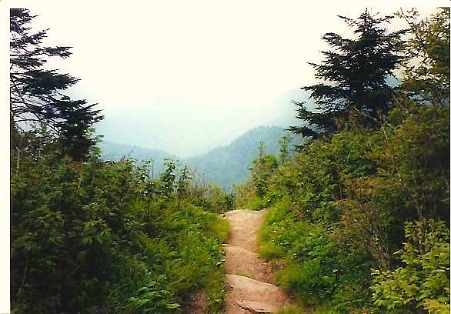 Easy hikes are a a great way to enjoy the Smokies no matter what your physical abilities. So, get out of that car and take a hike! Family hikes are a great way to spend time with your loved ones in the Smokies. History Hikes, Enjoy Days Gone By in the Beautiful Smokies! Come to the Smokies for history hikes! The Great Smoky Mountains National Park is home to over 100 historic structures. Hiking to them makes the experience even better! Long hikes are great for dayhikers looking for the ultimate challenge. Loop Hikes, Always Something New! Loop Hikes are perfect for hikers always looking for something new. Medium Hikes, Try a Little Challenge! Medium hikes in the Smokies are great for those in-between hikers looking for a little challenge. Moderate Hikes, Enjoy a Little Bit of a Challenge! Moderate hikes are great for those looking for a little challenge. The Smoky Mountains is waiting for you. What are you waiting for? River hikes are one of the most pleasant ways to enjoy the beauty and tranquility of the Smokies. Scenic hikes in the Smokies are simply amazing. Find out all you need to know about your next hike in the Smoky Mountains here. Short hikes are a great way to see the Smokies, even if you don't have a lot of time. What are the best waterfall hikes in the Smoky Mountains? They all are! Wildflower Hikes, Find Them in the Smokies! Wildflower hikes in the Smokies are a great combination of beauty and outdoor pleasure. Check out wildflowers in the Great Smoky Mountains National Park by taking a hike! Cades Cove, Put It On Your Must-Do List! Cades Cove is a must-see place to visit on the Tennessee side of the Great Smoky National Park. Enjoy wildlife, history, and beautiful trails! Cataloochee, Peaceful and Pleasant Hiking! Cataloochee in the Smoky Mountains is perfect for hiking and history lovers. This is the place where you can enjoy both at the same time! Deep Creek, Not Just Tubing! Deep Creek in the Great Smoky Mountains National Park is a delightful fall or spring hiking getaway. Elkmont, Famous for Fireflies, But Don't Forget the Hikes! Elkmont is famous for watching synchronous fireflies, but there are also great hikes in the area too. Newfound Gap, A Must-Do in the Smokies! Smokemont, A Smoky Mountains Destination for Wildlife and History! Smokemont is the destination in the Great Smokies to see elk and experience history. Camping in the Smoky Mountains, Make Memories and Save Your Budget! Find out why you should go camping on your next trip to the Smokies. Fall Hiking, Colorful Leaves and Cool Weather Awaits! Fall hiking in the Smokies is a perfect way to enjoy colorful mountains and cool weather. Great Smoky Mountains National Park, Get the Facts! Get the lowdown on the Great Smoky Mountains National Park. Find out what you need to know before visiting the most popular park in the nation! Spring Hiking in the Smoky Mountains, Try it and Love it! When is the best time to hike the Smoky Mountains? There's no bad time, but spring hiking is the best. Let me tell you why. Smoky Mountains weather is beautiful, but unpredictable. Check out these guidelines to see what to expect in general for every season. Wildlife viewing opportunities abound in the Smokies. Hit the trail and see them for yourself! Hiking Benefits You May Have Never Known! With so many hiking benefits, the question is not why should you hike, but why not? Advice for every hiker. Check out these hiking tips before your next hike! The Smoky Mountains Hiking Blog keeps you updated on additions and changes to the smoky-mountains-hiking-guide.com Web site. Subscribe here. Calling all Smokies hiking fans! Get the inside info on hiking in the Smoky Mountains. It's truly a hiker's paradise! Starting Your Own Business? It All Starts With Passion! Starting your own business doesn't just have to be a dream. It can be a reality. One woman's story of starting her own business that began with a passion. Would you like to share your knowledge about smoky mountains? Great, find out how you can submit your story or tip here.